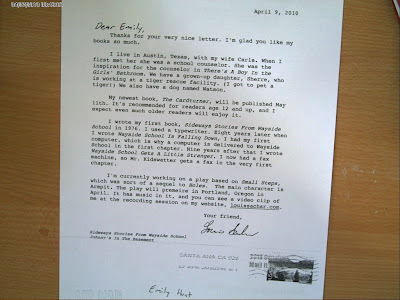 One of our year 6 pupils (Emily Hunt) has received a personal letter from Louis Sachar (writer of 'Holes'). Last Autumn Mr Brook's class read one of his books: There's a Boy in the Girl's Bathroom. Emily liked the book so much that she has since read lots of his other books. She wrote him a letter about his books and asked him about his latest project. He kindly wrote back to Emily - click on picture to see in full. Several of Louis books are about school life and have some fascinating child characters. Emily and the other children from class DB would recommend his books to anybody - children and adults. See his WEBSITE for details.